An entire animal species come back from the dead? That’s exactly the news out of Ecuador this summer, where three scientific teams rediscovered the Azuay stubfoot toad (Atelopus bomolochos), a bright orange amphibian that was declared extinct after a final sighting in 2002. The largest animal to ever come back from extinction, though, lives right here in the West—and will be featured in the December issue of Sunset. The wood bison is a subspecies of American bison just like its smaller, more famous cousin, the plains bison, hirsute model for buffalo nickels and the National Park Service emblem. The wood bison, native to Alaska and western Canada, was considered extinct after 1940, a victim of overhunting and habitat destruction as well as brucellosis and bovine tuberculosis. 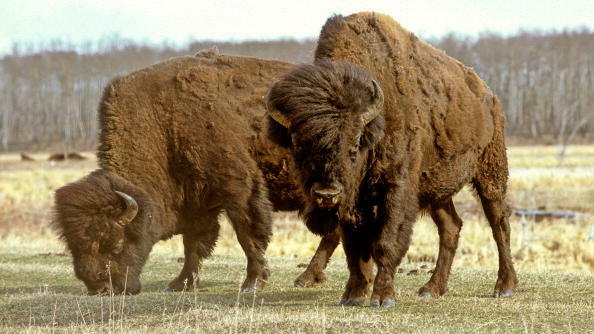 Imagine the surprise then, in 1957, when Canadian wildlife officers were flying over a remote portion of Wood Buffalo National Park in Alberta and spotted a herd of 200 wood bison. Despite their considerable size—they are the continent’s largest land animal with bulls weighing 2,000 pounds and standing 6 feet tall at the shoulder—and considerable numbers, they had gone unnoticed for decades. The discovery meant the wood bison had become a so-called Lazarus species, an animal that had returned from extinction, like the black-footed ferret, the Bermuda petrel, and the Caspian horse. The December issue of Sunset will feature my colleague Peter Fish’s account of how 100 wood bison were released into the Alaskan wilds last spring. As a casual birder, I’d love to see an ivory-billed woodpecker or the long-gone great auk. If you could bring an animal back from extinction, what would it be? Elephant bird? Javan tiger? Velociraptor? Iguanodon?